Free Fun: What’s in Our Own Back Yard? As the son of two WI public school teachers, my hubby’s spring break vacations included caravaning from Green Bay, WI all the way to the beaches of Destin, Fl. Teacher families from Green Bay would spend a glorious week soaking in the rays, playing volleyball on the beach and cooking over the fire. The stories of his childhood vacations are amazing, but did I mention that they camped… all week? If by chance you envision some cool, RV type camper camping, think again. Nope, this was the traditional, put up a tent and live in a tent all week type of camping. Hearing those stories, I marvel because as much I desire camping to be part of our family tapestry, I go for the occasional overnights or weekend get always. Yes, one week of camping every Spring Break elevates my mother in law to hero status. One of our “inheritances” when I married into the family was the twenty year old Coleman tent. If I knew how to scan pictures and post them, I would share some of the hysterical memories we’ve had in that beast. Yes….beast, but they are precious memories, non the less. So often, families go into debt for that perfect family vacation when often, magical memories can be made right around the cornr or even in your own back yard. Now, lest you think I’d turn down a family cruise, you think wrong. There are certain times in your life when a dream vacation is so worth it, especially after dreaming AND saving for awhile, but I can guarantee that a “No spend family vacation” can be equally as memorable. I shared last year how to plan a cheap family vacation without being…cheap. Well, we did an amazing extended family vacation again, this year at the beach, and it was amazing. Coleman appreciated how I was committed to creative family time and blessed me with some goodies. Remember how I encouraged everyone to take advantage of some last minute “end of summer time” ideas? We never got around to implementing them since football season snuck up on us, but the kids surely took advantage of it. As an adult, it’s so easy to forget about these simple joys. After two nights downstairs, I told them they needed to upstairs and they begged for another evening. I paused and thought, “Why NOT? Why would I be so quick to say no.” I decided to be a “Yes, Mom,” because honestly, why do I feel they have to sleep in their room? This is one of those opportunities where choosing to say “yes” builds relationships, and I am so glad I did. As soon as it dried up, I told them I would go outside and help them put the new tent up. Before I could even begin the process, I peaked out the window and the tent was nearly up already. Easy to set up tents are the best invention EVER in the camping world, and it was amazing that they could do it without my help. They had such a sense of accomplishment. 🙂 Even our dog thought this adventure was amazing. The beauty of raising children who appreciate that the Little Things are the BIG Things is that they help you remember the very truth you are trying to instill in them. Free Fun is the little thing that became a week of BIG things in their hearts. This little bit of intentionality in our own backyard will be the memories they share with their own children some day. Have you had any free or nearly free fun lately? Those kids look like they are having the best time! It is amazing what your back yard can offer! Just a note to let you know I’m really enjoying your blog. Just yesterday I wrote about camping out in the backyard with my children and how much fun it was! They thought it was great and can’t wait to do it again. It’s amazing how the simple things really do make the most impact. I clicked the link to your no money vacation and thought I would share a cheap vacation…State Parks. We have camped, but have also stayed in their inns which have proven much cheaper than hotels. Depending on the park, in the summer there are usually free activities for children and families…from crafts, to nature walks, and evening concerts. Often you can fish, always there are wonderful hiking areas and playgrounds. We have found memories of our son being Indiana Jones as we hiked and splashed through trails at one park, another time was his desire to attend every craft time at the naturalist station, and the time he slept in the car because raccoons were trying to eat our bug candle and he was convinced they were going to join us in the tent. You can eat at the inn buffets (lunch is cheapest) or do all of your own cooking. Either way it is an inexpensive all inclusive vacation. Plus there is no TV or internet and often cell phones can’t get service. In an emergency there are TV’s and internet services at the inn, plus board games etc. But isn’t it fun just to get away from it all. p.s. Thanks for inspiring me to do the 30-day shred. It actually turned out to be the 26-day shred since I missed 4 days here and there. It felt great while I was “In the groove” but then my knee started acting up after running one afternoon and I have been slowly walking since. Every year, my girlfriends and I have a “moms only” camping trip with the kids. We go to a mountain lake for a few days, camp, hike, kayak, and just hang around together. Campfire is always fun at night, with songs and skits. We got rained on this year, which is a major adventure in CA , where it almost never rains in the summer. I haven’t laughed so hard in a long time. It was good to connect with my pals, and my girls think it’s cool that mom tent camps. I’m with Noni about state parks. National parks, too. Some of our best family memories are from long summer RV trips to places like Yellowstone and the Grand Canyon. And Yosemite is right in our backyard — how lucky is that? You can buy a year pass for national parks, which pays for itself in two visits. Three, and you come out ahead. They also have a senior pass (“silver eagle” or some other catchy name) which is very reasonable. We recently blew up a queen sized air mattress and put it in our room. That night we let the kids come in…we all watched a movie and ate popcorn, then had a campout in Mom and Dad’s room. They thought it was great and have been begging to do it again. It’s so funny how such a little thing can be so fun for kids. We have 8 cans of food waiting by the door for 10/21 – Hunger Relief Day at the N.C. State Fair. I got the canned goods for tax only with the use of double $1.00 coupons at Harris Teeter on sale items. I am such a big fan of free fun…I drag my husband to as many State Parks as he can handle and watch for free admission opportunities for things I love to do. This weekend we’re going to go explore the old Occoneechee Speedway as a trail running training track. So cute! We actually did the same thing this weekend. (but there were only four of us in the tent). 😉 We camped up on some property of my family’s near Floyd, and had a blast. It’s so refreshing to just have some simple family fun! We just bought a package of glow sticks (the kind that you can make into necklaces or bracelets) at Target in the $1 section for $2.50. The past few nights we’ve waiting until about 7 pm when it’s somewhat dark here and we take a few outside. We toss them around or wear them and chase each other. We have all been having a blast for next to nothing. Our son can’t wait until its dark outside to go play with them. For older kids it would make for an interesting game of hide and seek. I think that we may have to try camping in the back yard one night before it gets too cold. 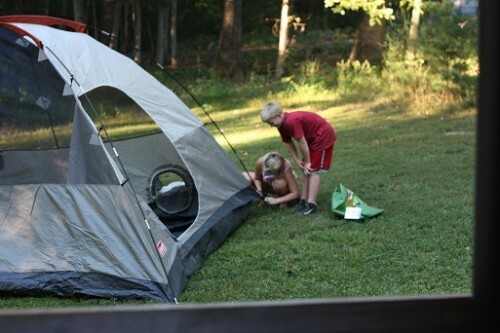 Camping is one of the best activities to do as a family, especially since it doesn’t cost much money. @Noni — State Parks are great, I agree. Keeping it in our own “backyard” I would check out the list of all the Green Bay parks at the Green Bay website. I remember doing this as a kid, what a blast!